Your player has worked hard and with team mates will have a great opportunity to participate in JO’s. This “player’s shirt” will give the team a presence, and shows unity. 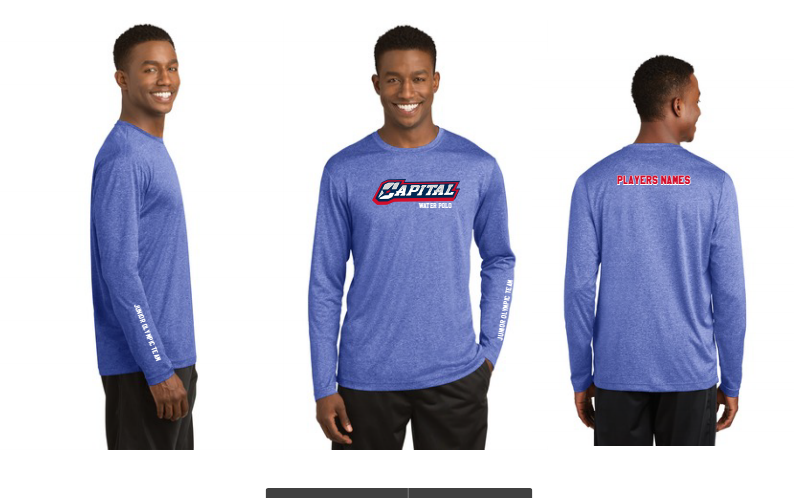 Specially designed Performance Shirts for Capital’s National JO team members are now on the Kap7 site to be ordered for players. These will be worn by players to show team unity and pride. The player’s name will be on the back of the shirt, Capital logo on front, and JO team down the sleeve. Shirts are “customized’ and $24. These shirts will be offered in the “Heather-ed Blue” material. Due to time constraints there was some confusion in creating the Kap7 site, and this is to help clarify. Purchase the long sleeve customized shirt for the players. You will be asked to enter the player’s NAME. Coaches want the players in shirts with names on back. The text size and logo will be larger than it is shown on the model. The short sleeve tees are available for anyone else. They will not have any ‘text/logo" on the sleeves. There appears to be an option to have names added on the back of these, but that will change the price and is optional. All shirts will be collected in CA, and distributed at team meetings there on 7/21, that decreases confusion in trying to distribute here at home before the trip or risk delays in shipment..
Order Deadline is Thursday, June 29.